Funazushi as we see it today is widely known as the signature Shiga dish that has been passed down from generation to generation. Whether because of its stinky nature or just the idea of miraculous micro-organisms hard at work in your food, this dish provokes passionate discussion, splitting people into two groups: you really love it or totally hate it. As you saw in Tokyofoodcast on the Trail of Funazushi, we started our April trip in Omitakashima, via Kinomoto, then, ended again in Nagahama, going around the big lake. This time, Et-chan and Te-chan were with a group of sake aficionados to visit some breweries in the area and we never intended the trip to be such culinary adventure. As is always the case though, sake and food go together, and the best way to enjoy the traditional drink is to really understand the local cuisine. Before I continue with the food and sake from our trip, I thought to share what I’ve learned from two books: Funazushi no nazo and Biwako no sachi dokuhon. Hopefully, I can communicate the essence of this food I love. Funa is the fresh water fish crucian carp. Sushi referred to here, phonetically changed here to zushi after the ingredient funa, is not what people recognize as sushi today. More precisely, funazushi is a form of narezushi, which is believed to have been brought to Japan around the 3rd century as a way to preserve scarce sources of protein such as fish and meat. The Engishiki, a book of laws and regulations from the 10th century, recorded that narezushi-style preserved fish, shellfish, boar, and venison were presented to the emperor from various parts of western Japan. Both the Engishiki and another legal record written in the 8th century, the Buekiryo, indicate that funazushi was gift to the emperor from the Omi region–that is present-day Shiga. When the way funazushi is made today is compared to ancient times, I am sure not much has changed. The fish is cleaned, cured in salt for sometime, cleaned again, then dried. Cooked rice is stuffed into the fish. Then, the fish stuffed with rice are layered on cooked rice in an alternating stack of layers of fish and rice until the big barrel is full. A heavy weight is placed on top just as in pickling, then the barrel is left as-is for a long time to ferment until the rice becomes like porridge. This dish has been traditional cuisine for locals in Shiga for a long time. If funazush preparation originally served just as a method of preservation, with today’s modern refrigeration it would not be necessary to go through the lengthy multi-year fermentation process. Why is it still made, then? In 1965, 60% of households in Shiga prefecture made their own funazushi at home. According to Funazushi-no-nazo, the dish is still served on special occasions or as part of religious ceremonies and festivals. It also serves as comfort food, in a sentimental way and as a remedy when people are sick. Secret family recipe are carefully protected and passed on to each new generation. 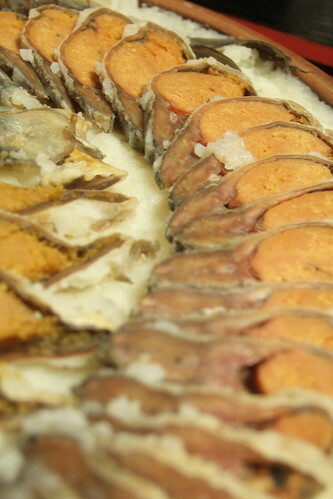 Funazushi made with authentic nigorobuna crucian carp from Lake Biwa is very expensive. For example, one whole fish about 25 cm long is 8,400 yen at Kitashina, one of the restaurants we visited in April. Why all the raving about this stinky fish? To someone like me who never grew up eating this pickled fish in rice, it holds no sentimental value. Is it a treat though? To me, the combination of nihonshu and funazushi is just heavenly. Anyone who loves blue cheese, I am pretty sure, will find the dish addictive. In recent years, craving for funazushi is growing from outside the lake region, but there are not enough funa. 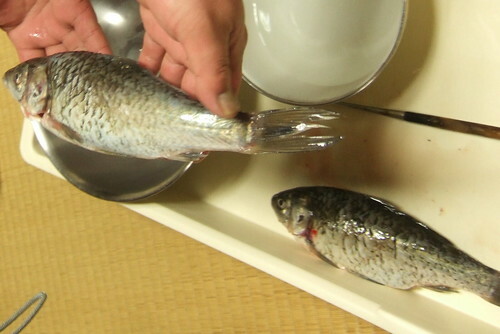 Nigorobuna, the species found only in Lake Biwa, is different from regular funa you find in lakes and rivers. As often shown in pictures, the best funazushi still have the ovaries intact. So, it narrows down the options even further. Continuing drastic ecosystem changes in this biggest lake in Japan is making the fish even harder to catch. In 1980, 800 tons of funa, including nigorobuna, were caught in Biwa-ko. 26 years later, the catch is down to 115 tons. There’s not much fish to start with. At the same time, locals are not going through the trouble of making funazushi at home as much as they used to. The number of households making it has declined to 30% in 1995, half of the number from the census in 1965. When I conducted my own survey and asked to people from Shiga I met if they still make home made funazushi, I got two replies of, “Yes, my grandmother makes it.” So, what used to be made in most homes is now only supplied by a few places, such as restaurants and specialty shops. Now, I hope you understand why I make such a big deal about the dish. In the next post, I will put together some Shiga regional dishes we had on the west side of the lake. Biwako no sachi dokuhon 琵琶湖の幸　読本　published by Shiga Prefecture Fishing Co-op. OK, So I went to Shiga in Oct 2008 and I got to eat at a fantastic Funazushi restaurant directly on lake Biwa. I had a crystal clear day with a hawk circling in the sky and the water out the window.. however, I have to say that funazushi really challenged my American palate! I guess I might be in the ‘hated it’ camp! So, you’ve had full Shiga experience. Iinaaa, lucky you! Little fishies, shrimps, etc… overlooking the lake. Nice! Oh my god, I know I would love this! When I was growing up, Chinese stinky fish was my favorite dish. I knew my high school boyfriend and I had no future when he said that the smell of it made him nauseous (JP, incidentally, is terribly fond of it). Such an interesting and informative post! I thought you guys would love funazushi with sake! Would this qualify your romantic getaway in Japan? I think this is where Tim had his funazushi.